Town in the government of Kherson, Russia. It was founded in 1754, and soon became one of the most important cities of southern Russia. The name of Yelisavetgrad recalls sad memories to the Russian Jews; for from that town issued the signal for the riots which brought upon them incalculable affliction and misery. As soon as Alexander III. had ascended the throne rumors of a rising against the Jews reached Yelisavetgrad, which caused the leaders of the Jewish community to apply to the governor for special protection. No notice was taken of the appeal, and on Wednesday, April 27, 1881, the dreaded outbreak took place. A religious dispute in an inn concerning the use of Christian blood by the Jews served as a pretext for the rioters, who proceeded to the Jewish quarter and commenced a systematic destruction of Jewish shops and warehouses. At first the Jews attempted to protect their property; but, seeing that this only served to increase the violence of the mob, and that the soldiers, who were called to protect them, took part in the pillage, they barricaded themselves in their houses. For two days the rioters perpetrated, under the very eyes of the officials, and with the cooperation of the soldiers, the most barbarous and hideous deeds. Synagogues were wrecked and Jewesses outraged. Two young girls, in dread of violation, threw themselves from windows. An old man named Pelikov, who attempted to save his daughter, was thrown from the roof by the enraged soldiery. Many persons were killed; 500 houses and 100 shops were demolished; and 2,000,000 rubles' worth of property was stolen or destroyed. In the revolutionary uprisings of 1905 the town was burned, and the mob killed the Jews and plundered their quarter. Semenov, Geographical-Statistical Dictionary of the Russian Empire (in Russian), s.v. According to the census of 1897, Yelisavetgrad had a population of 61,841, including 24,340 Jews. The latter are prominent in the city's commerce, trade, and industries, and three-fourths of its factories are controlled by them. The number of factories exceeds eighty, among them being grist-mills, machine- and tool-factories, foundries, soap-factories, brick-yards, vinegar-distilleries, and tobacco-factories. Only tobacco manufacture, however, engages any considerable number of Jewish workers. There are in all 522 Jewish factory-laborers, 363 day-laborers, and 3,164 artisans. The Jewish community supports a number of charitable institutions, among which may be mentioned a society for the aid of the poor (founded 1899), a loan society which lends money to the poor at a low rate of interest, and a Jewish dispensary with infirmary attached. More than 1,000 Jewish families have recourse to charity. In the winter of 1898, 1,100 families received fuel from charitable organizations, while 1,300 families applied for aid for Passover. The Jewish children are sent either to the general or to the Jewish schools, although Jewish boys are not freely admitted to the former. The Jewish schools include a Talmud Torah with industrial classes, two government schools (one with industrial classes), several private schools, a school founded by the local Zionists, and 122 ḥadarim, including a free ḥeder with sixty pupils. 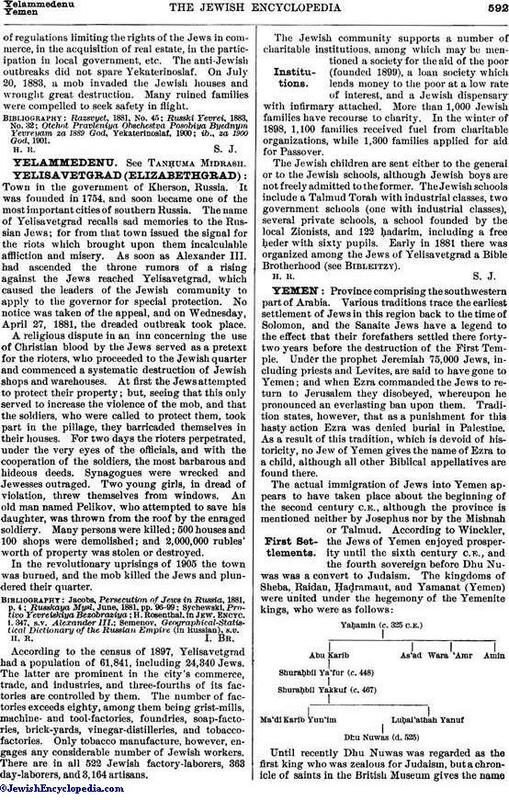 Early in 1881 there was organized among the Jews of Yelisavetgrad a Bible Brotherhood (see Bibleitzy).